I have written about buying non-toxic rugs for the playroom. I have opted for solid wood storage furniture from IKEA, rather than their better looking MDF counterpart. 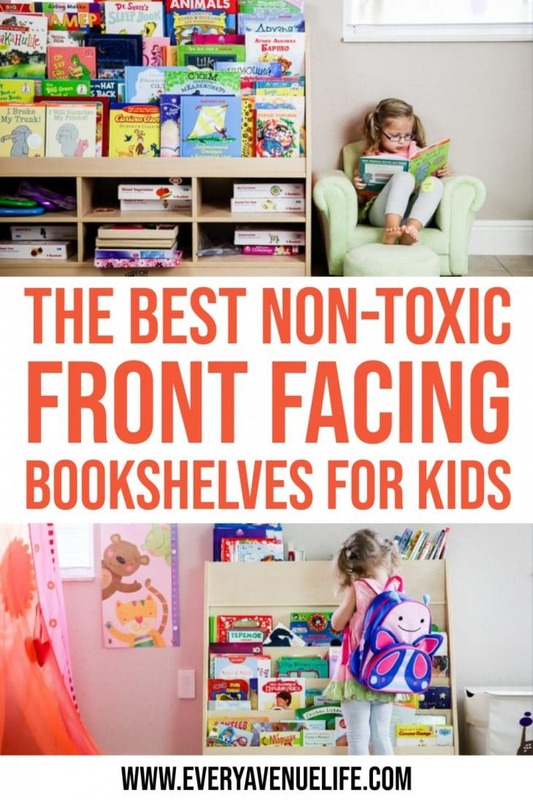 But the hardest part about creating a relatively non-toxic playroom was finding the right front facing bookshelf. She could read (by read, I mean have me read) 5-6 books meant for 4-7 age range in one sitting and then come back for more in an hour. That is a wonderful thing and is something we certainly encourage. I have spent the last year photographing her favorite books of every age in hopes that I could share these finds with you. And I will. Eventually. So needless to say, front facing bookshelf was the first thing I started looking for but strangely the last thing I found. Yes, certainly, there were plenty of bookshelves everywhere, but all made of MDF or particle board which is well known to emit all kinds of “wonderful” gases, along with formaldehyde glue. Yum! Yes, pretty much all the popular kids brands are that way, as can be evidenced by its pungent smell when taken out of the box. I felt I came too far in attempting to create a playroom that is as non-toxic as it could be and made too many concessions to make that happen, that the thought of giving in here just did’t make sense. It didn’t help that my hope was to get a front facing bookshelf, which made my search virtually impossible. I had considered accepting bookshelves that weren’t front facing for a short minute, but after an experiment I quickly discarded it. I feel it’s pretty relevant to this post so I will elaborate later. So then I found it! YAY! A company that makes SOLID WOOD bookshelves and slightly cheaper laminate veneer that are Green Guard Certified ( low or no emission). ECR4KIDS! I was even more excited when I discovered that almost their whole line of bookshelves is front facing. A company that gets it. 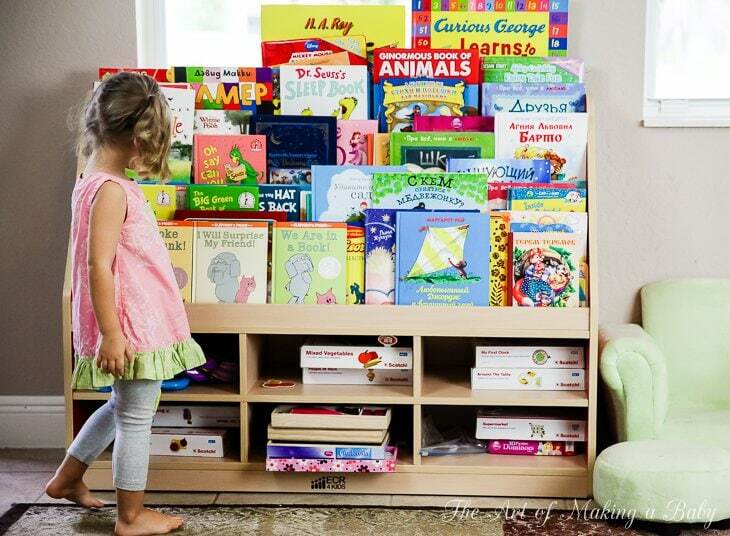 A Front facing bookshelf is something I discussed in previous posts when I was designing Lexi’s nursery. It’s very important, because it encourages children to read by drawing their attention to books. If they are stacked side by side, the books don’t have the same appeal to children, who are very visual at that age. 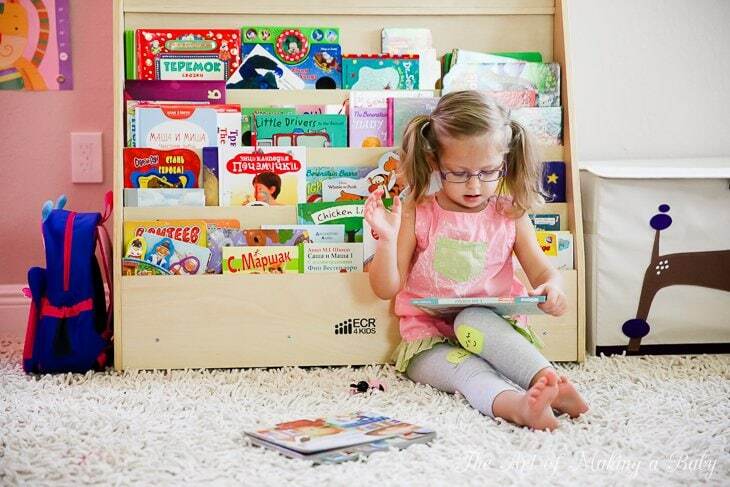 So using a front facing bookshelf is an easy way to promote reading and hence literacy, as well as love for books. At some point we had books sitting in a front facing manner in bins. That was my interim solution while I was looking for a different option. One day I said to myself:” I bet Lexi loves books so much that it doesn’t matter if I put them front facing or with their sides facing out”. I was running out of space in the bins, so that was a good move to make at the time. I expected nothing to change. She kept running up to the bookshelf, grabbing a book and after book, whatever caught her eye, and bringing to us. Whoa! This was amazing, the bookshelf was amazing, the fact that it was solid wood was amazing, the result was amazing. So just a bit about the company and the bookshelves. ECR4Kids mainly sells to daycare and schools. Solid wood is important there because of the wear and tear on toys and furniture. However the kinds of products that they manufacture can find a perfect home in any family that is looking for a less toxic alternative that can house many more books than the mainstream bookcases. Both have their own place, but still serve a similar purpose. is a more expensive version since it’s made of solid wood. That not only ensures that it doesn’t emit any toxic gases for 20 years, but also helps with the life of the product for families with more than one kid. It is slightly smaller and fits fewer books in the front facing position, however it has deep top pockets for book storage and a whole back that doubles as storage as well. 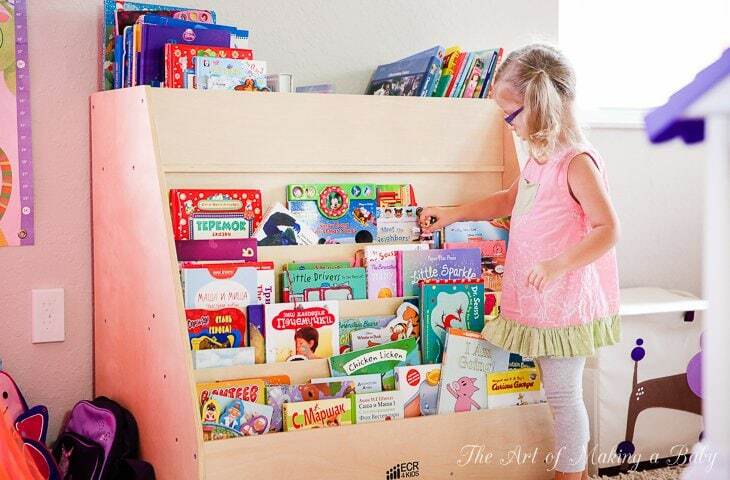 The back storage can be used for toys or out of season books. That’s where we store our holiday books: Christmas, Easter, Halloween, and pull them out when needed. The top section is used for books out of rotation and then regularly I switch some of the books out. You can see the size of this front facing bookshelf is pretty impressive, considering Lexi’s height in the photos is 38″, however despite the heavy solid wood, it is completely portable. It sits on wheels and can be pushed around if needed, which can be a very useful feature. retails for $100 less due to the fact that it is laminate veneer, but it is Greenguard Certified, so technically it is still an awesome option if you’re creating a non-toxic space for yourself or your children. It is not portable and it’s pretty heavy so moving it around is usually not an option, especially once you have put books in it ( I tried it, it will only slide slightly on tile). But it’s a perfect design for a playroom. I am actually in love with it. It fits a large assortment of books with a perfect space up top for those oversized books you can never find a place for. The bottom has storage, which you can buy bins for and keep all the small toys in, or put boxes of table games like we have since that is what we play with most. So I have to say, we have had these front facing bookshelves for 2-3 months now and I am just tickled pink about them. Whenever I review items that were sent to me by brands (which these bookshelves were), there is always a thought in the back of my mind on whether I would buy the item myself for the price they are advertised for. I always try to relay that in my post, if not in those particular words, but I think most of the time you can tell from the writing. ECR4KIDS also makes a ton of play furniture and toys, a lot of it in solid wood, so if you’re looking for something specific and would like anon-toxic option, check ECR4Kids products on Amazon or on their website. Whoa. Did you get both shelves for free?! I have been looking at getting one but space is my big reason to wait. Try using spice racks from ikea and mount them on the wall of you have wall space. Cheap temporary solution. That’s what we had when u couldn’t find anything else. Hi! Can you tell me what chair Lexi is sitting on there? 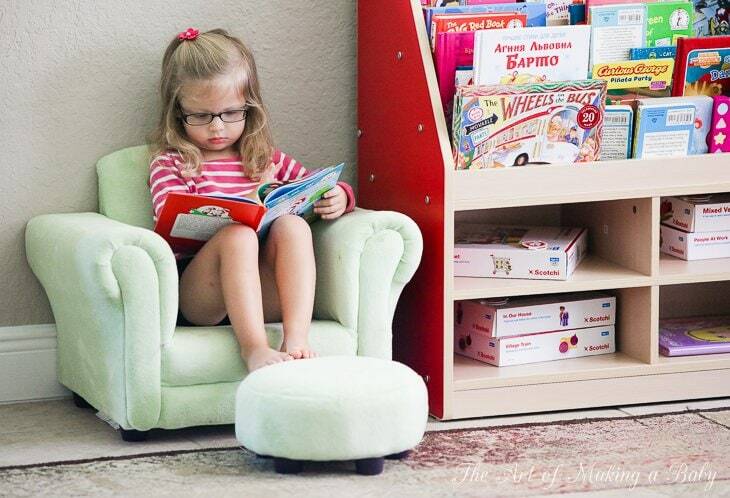 I am having the hardest time finding a kid sized reading chair that isn’t filled with PU foam and sprayed with fire retardants. Thanks! I bought it on zulily and while the company that manufactures it did assure me there are no BFR Sprayed on it I am pretty sure it’s pu foam. Haven’t had a chance to take th time to research brands that make chairs of solid wood and no pu. One step at a time. 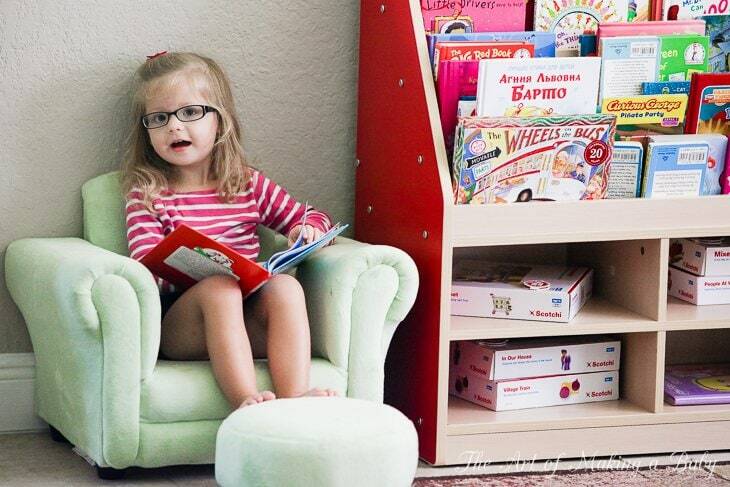 To be honest – I’d be more concerned about the chair rather than the bookcase, as she’s going to be sitting on it reading for long periods of time! :Shrug: Maybe that’s just me though. Awesome! Where is the chair from? I was excited to see this post, but I checked the manufacturer website and Amazon and cannot see where either of these products are listed for $100. On the ECR4Kids site they appear to be $250 & $350 each. They are less on Amazon but still a few hundred for the ones you posted. What am I missing? Can you include the link to the one above that’s $100? I have a newly turned 3 year old that is also a voracious reader. What books does Lexi like? I need to freshen up our collection. 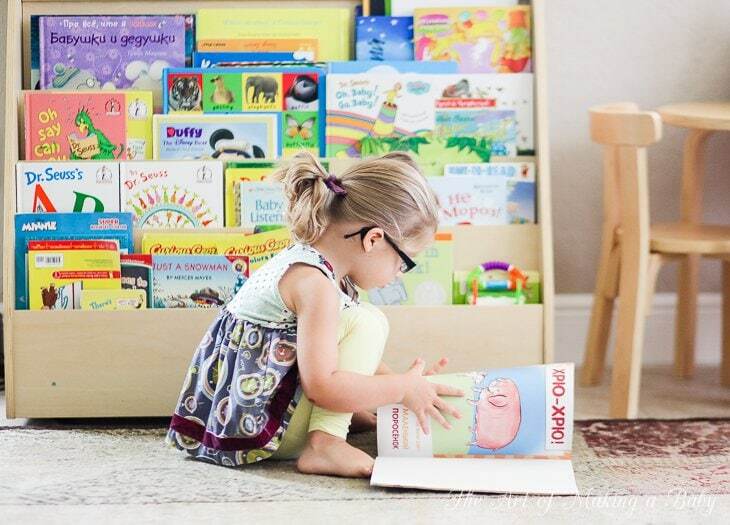 Do you have a book subscription service or how do you stay up to date on choosing good quality books for Lexi? I assume that the books in the case are for the photo shoot. I’m pretty busy and have a tough time researching quality Children’s literature. However I figured that you would probably be a great resource since you say that Lexi reads so much. I haven’t found the subscription service I liked enough to subscribe. So I’ve been largely going off her interest and the books I see at the library and then continuing with the series. If you haven’t started yet “Cat in the hat” learning library is an amazing series of educational books that she has been obsessed since she was slightly over a year. More so now that she is 2.5. We have been reading book after book. Judy moody series is her new love, any Disney storybooks that we get from the parks. They have amazing storybook collections. Recently she got into Sophia the first books. The actual storybooks not learn to read since those are too basic and are designed to be read by kids not to kids. There are a few others that I can’t recall. She enjoys actual longish stories where she can follow the pilot and then recreate it in her pretend play. Oh all Mo Willems books are hilarious though they are pretty basic when it comes to dialog. About 30-40% of our books are in russian so can’t recommend those. My focus with her is on things that she is interested in. Like characters she loves and then we go into overdrive on storybooks with them. Because when they are interested they are more open to new material and learning. She learned so much from the CITH learning library. We were at the bodies exhibition in lv and she was showing and commenting on and naming organs, types of bones in our bodies, talking about blood, brain, intestines. Oh and the bookshelf isn’t staged. That’s what was in it at the moment. Though I actually appreciate you assuming that it was staged since it’s one of my pet peeves when people think that everything they see in magazines or blogs is real life. It’s not always. Wish I could afford those bookshelves for my classroom! Teacher recommendations please? Age appropriate (she usually reads 4-7 age range) and preferably with beautiful illustrations. I didn’t know there are nonfiction books for 2 year olds. Open to suggestions. I don’t mean anything crazy like non-fiction books about historical figures, but my young students love books with real photos. In kindergarten we did a farm unit and all of our books for readalouds were non-fiction with real pictures of farm animals, farm equipment, etc. Some of the books had simple language (“I see a tractor”) and for the books that were too wordy or dry, I would just read excerpts or talk about the pictures- “look, the mama pig is feeding her babies! Baby pigs are called piglets.” Non-fiction text helps build vocabulary and background knowledge, and I’ve found that my students love having conversations about non-fiction text. They ask questions and want to learn more, which is a wonderful thing! I teach 6-year olds now, and many of their favorite books in my classroom library are non-fiction books about animals, space, bugs, vehicles, etc. I realize Lexi is not even 3 yet, but it can be something to keep in mind as she gets older. I love the idea of books that are illustrated with photographs. However most that I have come across are too simplistic. Books with one or two liners don’t hold her attention ( aside from certain rhyming books). She prefers longer books with a plot she can recreate. She’s always liked that, but now that she is huge on pretend play, she adores reading fiction. A lot of books we read are about all those things you listed: space, bodies, nature, bugs, too. She has learned so much from them. If you have recommendations for longer books with a lot of text and good illustrations, I am all ears. Bearport Publishing and Capstone Pebble Plus are my two favorite publishers for non fiction books for young readers. Not sure if this is exactly non-fiction but I found a series of books called “I am….” Everyone from Rosa Parks to Babe Ruth is covered. My kids particularly like I am Abraham Lincoln and now our 7 year old has three shirts with Lincoldn on them and knows quite a bit about him. Both kids have spent much of their computer time asking Siri questions about him (with my supervision of course). They are by Brad Metzer and might be an easy way to slip into non-fictionish books. Not sure of the age range but my four year old listens and pretends to “read them” (i.e. summarizes his recollection of the page for us) and my 7 year old can easily read them and has been able to for more than a year. They are both illustrated as well as providing real pictures of important happenings. Where do you get the Russian books? I actually would like a recommendation on those – I have not seen the books that I grew up with on sale here (Marshak, Bianki, fairy tails, Pushkin to just name a few…). Also, do you buy/play any of the Russian cartoons or movies (child appropriate)? My parents do not have the opportunity to visit as often and stay as long, as say your mom, so I would like to get my daughter exposed to some dialog in Russian, a little more than what I provide. Ideas welcome. Thanks!!! You have to take some time looking through their immense catalog to find the right stuff. It usually takes me 2-3 hours to pick out books that I want ( i order 10+ at a time). And it costs an arm and a leg for shipping, but in the end it’s worth it to me, since it helps her with Russian. I am about to do another order with 25 books of characters that she loves plus some new books I’ve picked out and it is going to be $300 with shipping to Russia which is cheaper, so I am asking my mom to bring them with her to save on shipping. For Russian shows, it’s an interesting story. I have trying to find Russian versions of American shows she loves, but no luck. I found Daniel Tiger online but I prefer airplane mode when she uses devices for protection and she mostly watches on our car rides, so obviously that would work. I noticed she likes Pchelka Maya the most. Also Luntik, which is an original Russian show. Then of course Daniel Tiger, Sophia the First, Frozen, all in Russian. Before then she only watched DT in Russian out of these shows, so as far as she is concerned these shows ARE Russian. 3. She started understanding complex words that I know I never introduced to her. There was a book I tried reading to her a few times that she would get bored of quickly because it’s in Russian and it’s meant for ages 4-7, her Russian comprehension is on her age level unlike English, which a few years ahead. So anyways, I read that book to her again a few days ago, and she sat through the whole thing and then asked follow up questions (in English) but it shows much better understanding of Russian just after a few weeks of Russian shows. So I am very happy. It’s a good supplement to our otherwise primarily English home. Thanks so much for the information – I REALLY appreciate it, and such a long and detailed response! I am sorry about your mom being delayed, I do hope that this is not the visa issues due to the current political climate… and I DO hope she is in good health and all is well otherwise. I am always worried about the “torrents” due to copyright and viruses, but since I have a MAC now, viruses may be less of a concern. You know, this may be too personal of a question, but are you planning to go visit Russia anytime soon/at all? I would love to take the girls to Moscow, and now I am thinking for the Soccer World Cup… they would be the right age 🙂 It is going to be expensive, but at least I have a place to stay 🙂 Also, I would love to see all the places that are dear to me, and my university, and may be even visit St.Petersburgh. All the nostalgia. I would also love to go back to Paris – that would be such a cool city to visit with the girls when they are older. But I totally digress… anyways, thanks again. I considered World Cup as our first trip. Then I thought I would maybe take her next year cuz of the sensitive time in language development. I was just sort of commenting on what I feel is a sensitive period for her. Like right now. She has been speaking English for a while, but only recently has started picking up Russian words here in there. Lots of things come into play here probably. I just really want to take her as soon as possible. Plus the sooner you start them…. Not sure if it will happen though, lots of paperwork to get in order before we can go and zero time to do it. We’ll see. My mom keeps saying that she has forgotten what it’s like to spend winter in Russia… It’s been 3 years since she did. This year though we are thinking about taking Lexi to some place snowy. Again, because she seems to take so much away from all our travels, showing her snow would be awesome right now. Hi- I didn’t read the whole post but I am pretty sure you didn’t mention this option– Muzzy. My 4 year old is in preschool and is in a Spanish Immersion room as well as taking an enrichment course of 3 hours of Mandarin Chinese every week. We started using Muzzy with the kids at an early age and they have a ton of language options- I would bet good money that they have Russian available and the show is specifically designed to help teach languages. It is sort of Sesame Street like about a big fuzzy time traveling “monster” (but not a mean one) that eats clocks and a King, a Queen, and their daughter. The graphics/production quality might be considered low budget but that doesn’t bother me. I prefer the simple music and stories to some of the blaring, hyper, in your face stuff I see on tv these days. Dimes to Doughnuts you could get Muzzy DVDs in Russian. I think our DVD is Spanish, German, French, British English, and American English- how funny is it that they included the Queen’s English as a separate language? Elena, they have many Kanye distributors. I would contact the company and see if they distribute to eu or if they know of any U.S. stores that carry their product that ship to eu. This is my favorite list!! Start with miss ruphius! Fantastic book!! Gracias! I’m trying to focus on russian books and not buy too many english ones but I’m a sucker for books so I will see if there is anything fun. 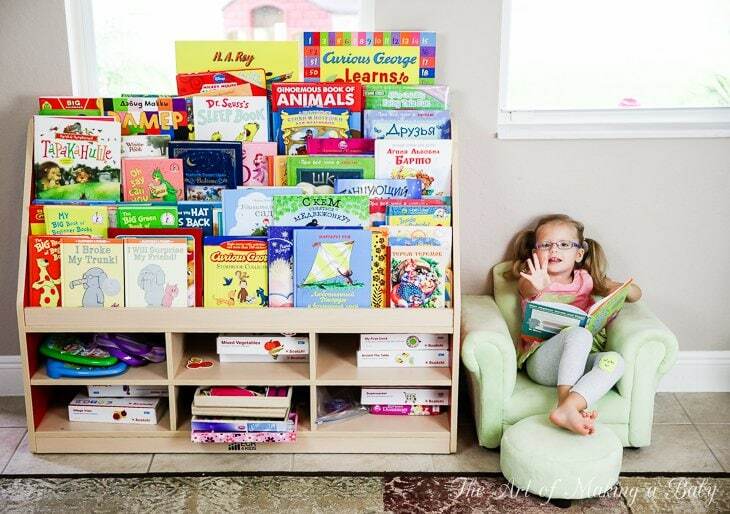 Just here to say that you don’t NEED fancy bookshelves to encourage a child to read. We had boring old side-stacked bookshelves (and still do), and both my kids are voracious readers to this day (now in their late teens). Sure, if you want to buy lots of stuff and can afford it, go for it, but honestly, you don’t even need to buy books, your local library serves exactly that purpose. Absolutely. All children need is attention and encouragement from parents. But front facing bookshelves do help those kids who are not naturally drawn to books. Some kids just have a strong interest from birth like Lexi did. Others have different preferences. 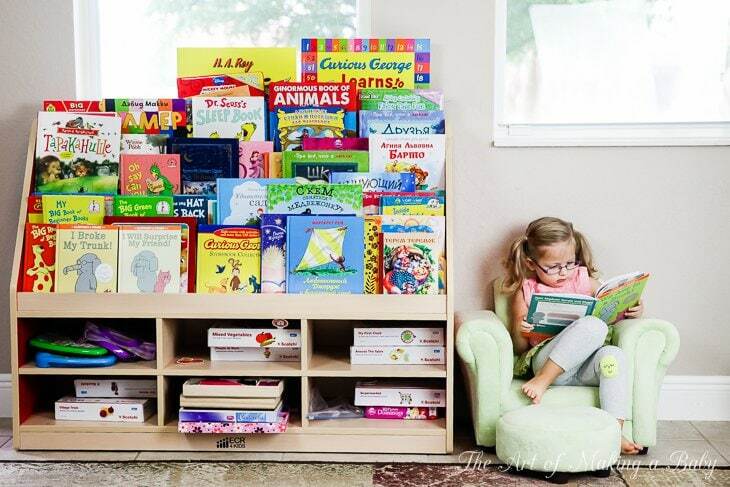 Can you provide some data showing that front-facing bookshelves help kids who don’t like to read? 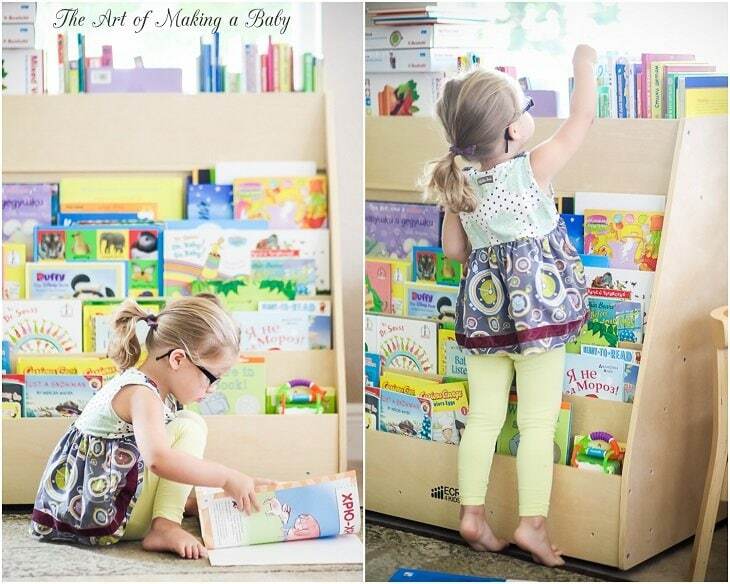 You seem to say that Lexi naturally had an interest in books (from birth :-)), so she didn’t need the special bookshelves, right? Do you have any other data points beyond your own child? As I said, anyone is free to buy what they want, but I’m challenging these vague anecdotal generalizations that encourage people to buy more and more ‘stuff’. I’m sure you can find the data if you wanted to spend the time looking. I don’t consider bookshelves unnecessary “stuff”. They hold some of the most important things to a child’s future, whether front facing or not. Not everyone wants to store books in bins. In my experience as a classroom assistant for 3-4 year olds, I have to say that I’ve never come across a child who isn’t interested in books and being read to! 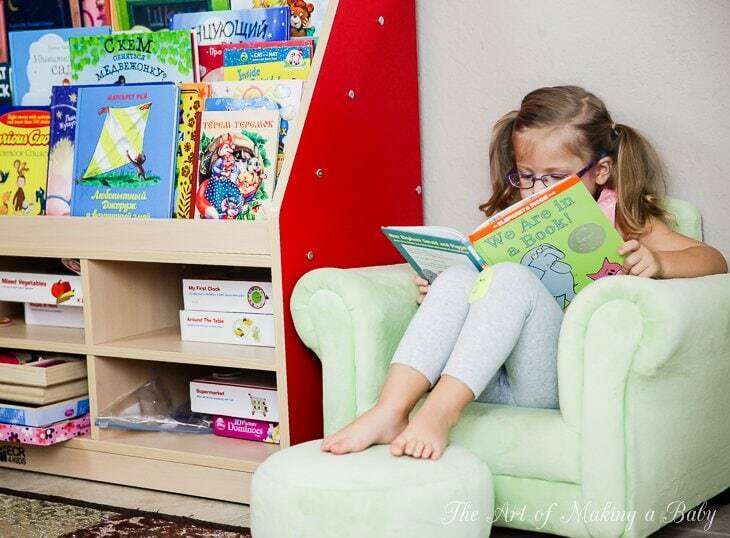 The front facing bookcases look great – especially in a school setting, but they don’t actually hold many books. My own kids used to love pulling books out of the bookcases around our house to look at, which were well without their reading age! I also don’t think that you should write off books because you think they’re too easy for her. Board books are great for sounding out letters and starting to learn to read properly, not to mention developing their imagination and creativity to make up stories that fit in with the pictures! 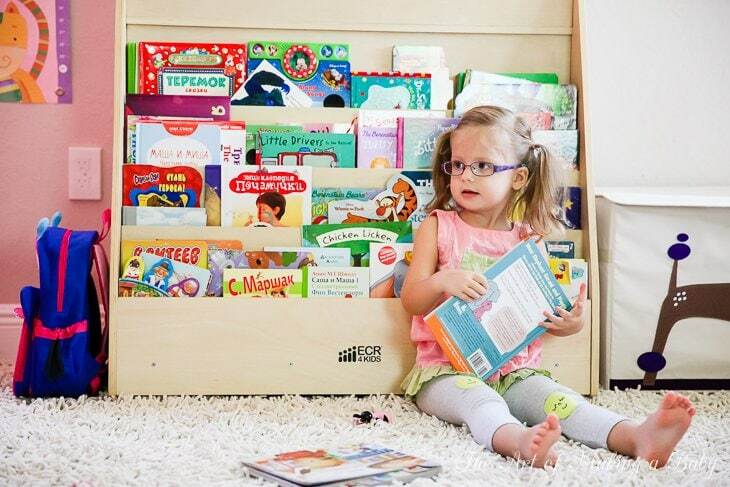 I have also heard that front facing bookshelves tend to pique a child’s interest in books because they can see the covers and easily access the books. I don’t know that it would magically turn a child who doesn’t enjoy reading into a child who enjoys reading, but it makes sense that a child might become more interested in books if they can see them. 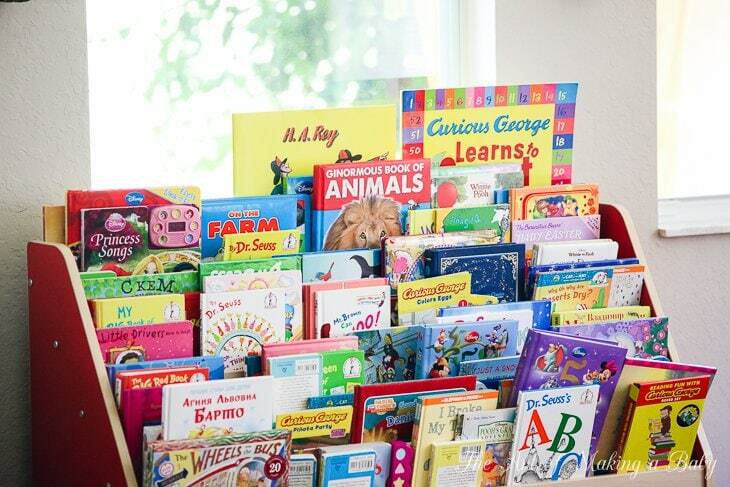 Think about if you kept books hidden in a closet versus in a basket where the child can see them and easily access them. The books tucked away in a closet might become forgotten about, or at least not asked about as frequently. We have spice rack installed from Ikea, great solution for small spaces, too bad they don’t hold many books. But photo ledges probably do, since they are bigger? as a former teacher, i can vouch for the connection between forward facing and literacy promotion. it was something that was promoted starting in teacher prep courses. my first classroom was a special ed pre-k room and forward facing was something i really wanted to try. of course the district was not going to purchase any big bookshelves at that time so i used my own money to purchase plastic rain gutters from home depot and had them installed at floor level to house the books. worked like a charm and the kids always recognized when a new item was added to the collection. i’m a therapist (kids mental health) now and even in a smaller office will try and display books facing out….either on a small table or mounted shelf. 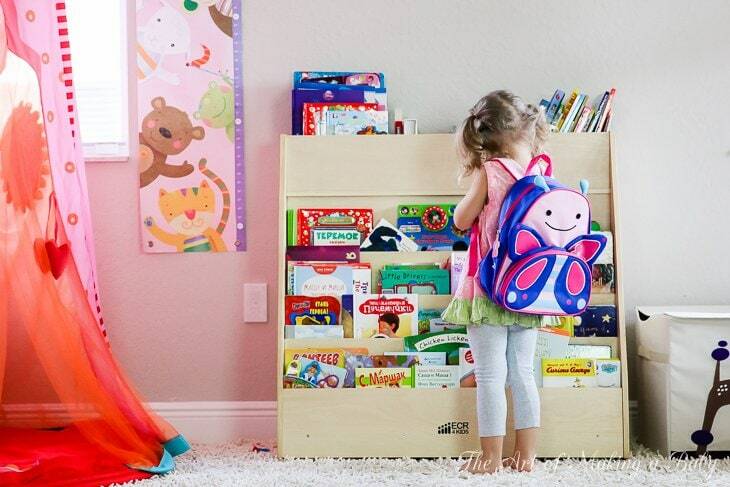 Are you guys getting ready to send Lexi to preschool? I didn’t know you had her tested for reading comprehension. That’s great! Love the bookshelves but they are a little out of our price range. some guy called jim trelease wrote a book about it.’the read aloud handbook’ or something. it’s more a theory than a study, if u ask me. 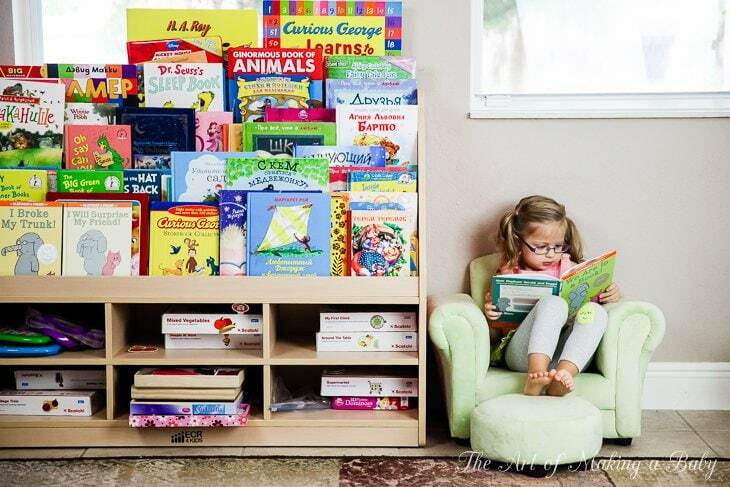 i personally like the look of front facing bookshelves, so that is why i am planning on setting one up for my daughter.